The Mount Alexander Shire Council works to reduce disadvantage and exclusion of people with disabilities. Our focus is on a holistic, long term and sustainable change. developing partnerships and projects that respond to local needs and priorities. Council has an access and inclusion survey open from Wednesday 1 to Friday 31 August 2018. Complete the survey at the Have Your Say section of our website. 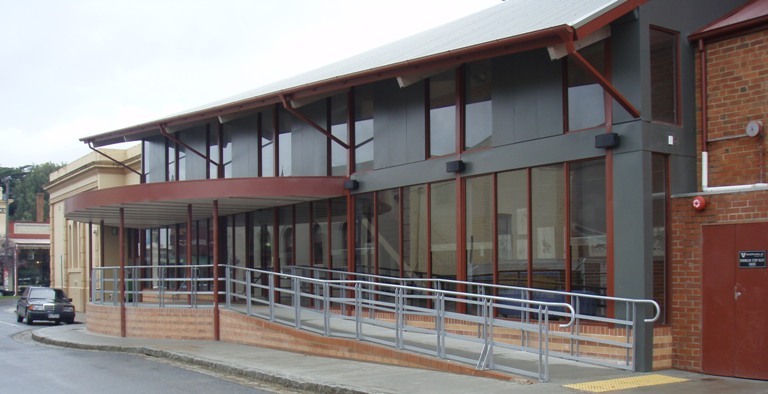 Mount Alexander Shire Council has adopted an Interim Disability Action Plan (iDAP) 2015–2017. The Plan outlines Council's commitment to actions that will improve access for people with disabilities to Council services, facilities and information. Download a word version of the Interim Disability Action Plan. Download a PDF version of the Interim Disability Action Plan. Maps are available to guide you around Castlemaine, Maldon, Newstead and Harcourt. The maps are designed to support local residents and visitors with limited mobility, including those in wheelchairs, on walking frames, gophers and even those using prams to get around the towns. They include features such as accessible parking, toilets, parks and other points of interest and have been designed to enhance community inclusion and participation for people with a disability. Information about local transport and services for people with disabilities is also featured. The maps can be downloaded below. Hard copies of these maps are available at the Castlemaine and Maldon Visitor Information Centres. The maps will also be made available in text versions in the future. People with a disability can apply for a free disabled persons parking permit from Council.